Advanced Manufacturers in the GTA have access to a unique talent pool: the GTA design workforce. There are 25,645 designers working in the region. This well-educated and highly skilled multi-disciplinary design workforce represents the largest concentration of designers in any Central Metropolitan Area (CMA) within Canada, and the third largest centre for design in North America. GTA is a leading North American Centre for Design Talent - The GTA is a design centre for North America with a high concentration of expertly-trained designers in the workforce. There are 25,645 designers working in the region. GTA Design Workforce Ranks #3 in North America – the Toronto region has the largest design workforce in Canada and the third largest talent pool of designers in North America, after New York and Boston. The Design Workforce is Growing – the region’s design capacity is growing. Between 1991 and 2001, the 4.7% annual growth rate for the design workforce significantly outstripped growth in the overall labour force (which grew by 1.4%). Highly Educated and Skilled Design Workforce – Approximately eight-five per cent of designers in the region have a university or college level education. Access to Range of Design Disciplines - The design workforce in the GTA is broadly-based with strong representation from the six design disciplines: Industrial, visual communication, interior and fashion design, architecture and landscape architecture. 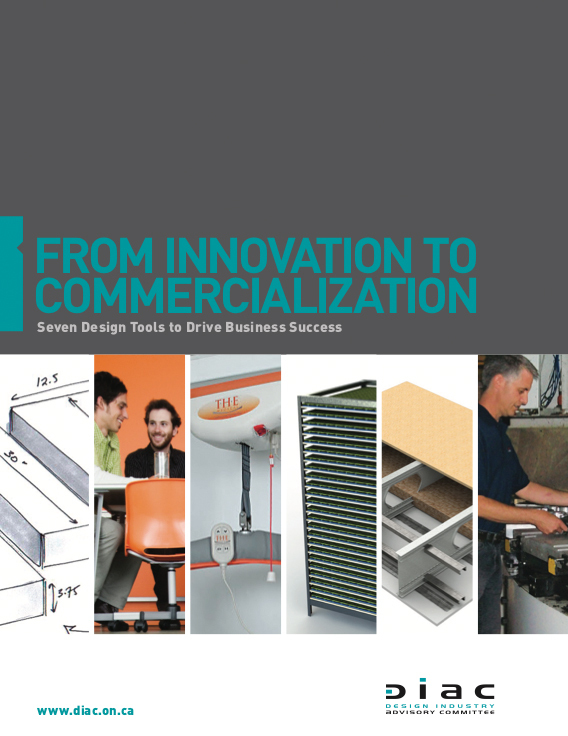 High Creativity and Problem Solving Skills – Industrial Designers in the GTA demonstrate their creative talent and ability to integrate new materials and advanced technologies into innovative new product concepts for industry sectors including contract furniture and medical devices. Design Education Infrastructure - The GTA has a strong design education infrastructure with the region’s three universities and five colleges of technology and advanced learning offering three and four year degrees in design. The University of Toronto offers graduate programs in architecture and landscape architecture and York University recently launched Canada’s first Master of Design program in Visual Communication Design. York University, Ryerson University and George Brown College offer post graduate courses in Design Management. York University and Sheridan College Institute offer a unique, joint Bachelor of Design Program in visual communication design. Centre for Design Research - The university and college network in the GTA provide specialized courses and research opportunities on a range of design themes including Designing for Sustainability, Design for an Aging Population and Game Design. The region affords opportunities for collaborative design research connecting design faculty and students with researchers in engineering, business, the social sciences and other disciplines. High Level Expertise in Industrial Design – Two of Ontario’s three internationally-recognized, post secondary institutions offering industrial design degree programs are situated within the GTA. Humber College offers a four-year degree program in industrial design and has recently become the first institution in Canada to offer a specialization in automotive design within this degree program. The Ontario College of Art & Design (OCAD) offers an industrial design program with specialty courses in materials & technology, design research methodologies and interaction design. GTA is a Centre for Branding, Communication and Information Design – Approximately half the designers in the workforce are visual communication designers with high level expertise in branding, corporate communications, packaging design, web site and interactive design, information design and signage systems. Highly creative visual communication designers work in almost every sector of the economy within the GTA. State-of-the-Art Facilities Design - Architects, landscape architects and interior designers working in the GTA have a strong track record in designing and building state-of-the-art manufacturing facilities for advanced manufacturing industries. Partnering with designers, manufacturers have been able to introduce innovations to enhance production efficiencies, to improve indoor air quality and to reduce the environmental impacts of building materials, production processes, water and waste disposal. User-centred Design Research – Designers in the GTA collaborate with research institutions and corporate clients on ethnographic research exploring user behaviours to inform the design and production of products in health care, automotive, transportation, electronic communications and other industry sectors. Universal Design and Human Factors – Designers in the GTA are well trained in the principles of universal design. They integrate strategies to enhance accessibility and usability and to reduce human error into the design of technical equipment and consumer products. Multicultural Awareness – the multicultural environment in the GTA, has heightened the sensitivity of the local design workforce to cultural issues. GTA designers are highly skilled in customizing the design of products and services for export to other cultures around the world. Professionalism of the Design Workforce – Designers in the GTA are accustomed to meeting the needs of clients in a dynamic, fast-paced business environment. They display a high level of professionalism and organization in the delivery of services on time and on budget. World-renowned Project Management Skills – Designers from the GTA are hired around the world and well respected for their strong project management skills. Environmental Responsibility – GTA designers are taking a proactive stance in helping clients to reduce environmental impacts in product development, production processes, materials sourcing, packaging and distribution practices. Integrated Approach to Design Process – Architects, industrial designers and interior designers work on cross-disciplinary teams within the GTA to integrate strategic design practices and sustainability strategies into the development of state-of-the-art industrial facilities that enhance productivity and enable innovative product development. Products of Local Suppliers Informed by Design – Local suppliers to the manufacturing industry have drawn on the local design talent pool and worked closely with designers to improve the quality and added value of the products and services they provide to manufacturers located in the region. Proximity to Major US Business Centres – By concentrating both design and production in the GTA, manufacturers have easy access to North America’s top markets (135 million people within a 500 mile radius). This proximity can also help to reduce the costs and environmental impacts of distribution.